Â Lakme eye artist pen -As the name suggest it is a pen which to bring out the artist in you.You can create wings and structure your eyes with it.It is a unique kind of a tip which gives one a proper control and whenever one doesn’t have the time to dry up their eye liner then Lakme eye artist is a great pick . Eye liner on my eyes.I didn’t want my eyeliner to be too intense in this look andÂ therefore applied it with a light hand. No eye liner gave me so much of control which this pen did. The staying power is pretty ok . This eyeliner dries up in seconds.I some times don’t even wait a second and start using my mascara. Â When ever this pen is with me I really become an eye artist.Creating wings is so easy with this eye liner. It’s a great product for those who are afraid of using liquid eye liner. If one wants less intensity in the black shade it can be easily done.So basically it becomes an eyeliner which has possibility of light shade as well as dark shade too. I find the product little expensive as the ink dries down soon. Â I have to be very very care full while using it because it inks my hands every now and then. Â It is a pen and I expected to go well with my water line buy it didn’t. If you prefer very thin eye liners then I don’t think so it will work for you at least it didn’t worked for me when I tried applying thin eye liner on my eyes. Lust it, love it or hate it? I don’t lust the product but yes I love the product.All in all it is a great buy and it will suit my vanity case. Worth a buy– I am sure every one will like to give this interesting product a try once.Isn’t? Have you tried Lakme eye artist pen? Hi Anamika,I found the lakme pen pretty thick..I think they should kept the tip quite thin. Gunjab even i feel that tip should have been more slimmer..how long have u been using it..is the shade still intense and pigmented..mine has started smudging..
yaa it is easy to take it off…I don't mess up with my eyeliners or mascara often but this one really mess my hands..may be because i take it too casually..like a sketch pen only…but how come u mess with eye liner that too on hand ?? hiiiiiii! I hope you remember me specially since I've been gone sooooo long! I'm thinking of buying it but still not sure! Thanks for the review! Yup Rij I do remember you..the girl who have great plant and trees near her house:)where have u been? I was happened to some how like this product, as am bit scared of liquid eyeliners. Atleast for the cost I expect my eyeliner should be used for 6months.. which i didn’t. Packing- It directly comes as pen sealed with plastic wrapper. Color- Dark & Light black, it depends on the way you apply. 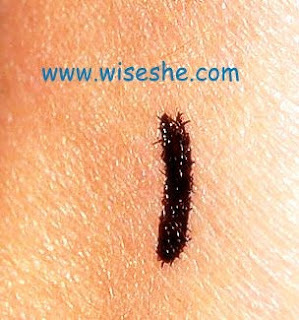 Ease- Very easy to apply, specially those who like their liner to create wings. No I won’t buy it. IT IS NOT CRUELTY FREE SINCE IT IS TESTED ON ANIMALS.